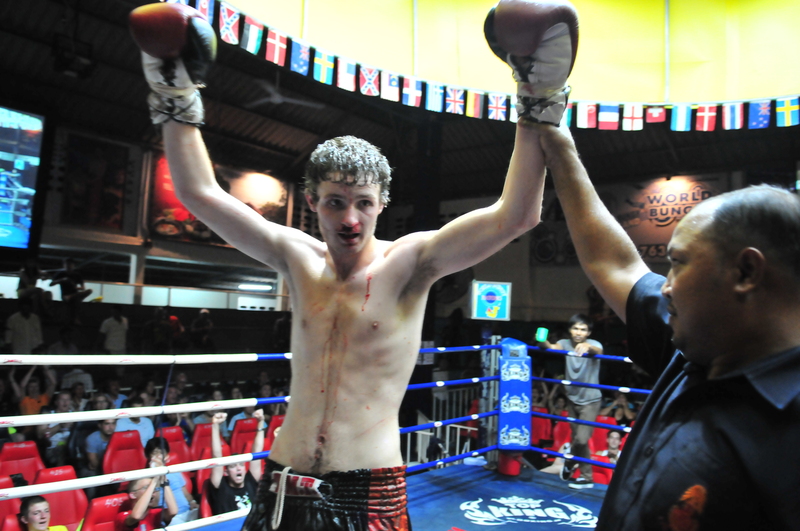 Three fighters representing Tiger Muay Thai and MMA Training Camp Phuket, Thailand came away with victories Monday night at Patong Boxing Stadium, including two first round KO’s and a thrilling third fight that went the distance. The fight of the night was down to 16 year-old Leo Tyson squaring off against 25 year-old Jason of Brazil. Tyson, making his debut, faced a veteran of four fights and somehow managed to overcome the first round jitters where he began to bleed from his nose. He came back with a fierce second and third round, landing strong punches and several elbows that seemed to unsettle his opponent. “I felt pretty gassed but the crowd – I heard them chant my name and it was a great feeling,” the half Englishman half Aussie said. By the fourth round, Tyson clearly had his opponent teetering though neither fighter let down their guard. Tyson caught Jason with a strong flurry of knees despite eating some big shots to the face. By the end of the fifth round, judges had seen enough and Tyson was given a unanimous decision victory. “I was quite confident and felt really good going into my fight. My corners Roger Huerta and Songkram told me exactly what I needed to do. It was definitely a big step up,” Tyson said. Daniela Bright finished off her opponent, Reya of Thailand, in just under 35 seconds after a strong kick to the head. The fight started with some rolling punches, but Bright quickly used her leg to slap Reya across the face with her foot – ending the bout. “Her guard was down, so I thought I’d kick,” Bright, of England, said after the fight. “I knew my legs were my strong point since I did a bit of kickboxing back in England,” she said. Canadian Justin Doabosiff landed some elbows in his fight against Thai national Jackgrid. Doabosiff pushed the pace the entire first round, working the body with several punches and kicks. He finished off Jackgrid with a devastating knee to the gut. “I went in there with a game plan to dictate the pace. I knew it was over once I hit him in the gut. I heard that noise and felt it was really well placed,” he said after the fight.